Everyone’s attention this month has been on the Olympics, and rightly so, but August can also be a time to reflect on China’s War of Resistance against Japan (1937-45). Throughout the entire month of August 1938, Japanese planes bombarded Chiang Kai-shek’s Nationalist Party headquarters in the first provisional capital of Wuhan, a tri-city region in the central Yangzi river region in Hubei province. The fall of Wuhan after a protracted ten-month battle, on October 25th 1938, forced the government to move further inland to its second provisional capital, the city of Chongqing in Sichuan province. This gives us some perspective as we reflect upon the unprecedented success of the Beijing Olympics, 70 years after Japan seized China’s second capital city in one of modern history’s bloodiest wars (though they did try, Japanese bombers were never able to annihilate Chongqing). 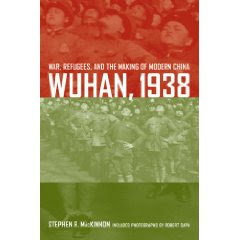 Having already produced several excellent works on this war (too many to name, in fact, but one notable book is his co-edited volume, China at War), Stephen MacKinnon has put forth a very bold argument in his latest book, Wuhan, 1938: War, Refugees, and the Making of Modern China, published this year by the University of California Press. MacKinnon asserts that those ten months in Wuhan—from January 11 to October 22, 1938—forever changed Chinese society in no less than four significant ways (listed here in no particular order). First, the mass of refugees pouring westward from the besieged east coast caused a public health crisis, the creative responses to which led to the creation of a new kind of public health infrastructure and new ethic of responsibility to care for the wounded and sick, which MacKinnon argues served as the foundation of both the PRC and the ROC states’ health systems in mainland China and Taiwan, years after the war’s end. Previous estimates of wartime refugees have ranged from 3 to 90 million, but MacKinnon believes that there were over 100 million civilians fleeing the eastern war zone (p. 60), making this the single largest forced migration in Chinese history (the Taiping Rebellion of 1851-64 produced about 30 million). Although refugee relief efforts were more successful within the urban area of Wuhan than in the surrounding countryside, MacKinnon argues that the relief effort fostered a new definition of national community because it brought together people from all walks of life and both sides of the political spectrum, and incited the participation of state-run organizations, which for the first time worked in concert with private charities. Relief organizations managed to serve about half of this massive refugee population (so MacKinnon argues, though the one statistic he cites doesn’t back this ratio up), and sparked new interest in voluntary service, especially among the 100,000 student refugees in Wuhan. The urgency of this refugee crisis brought about a second fundamental change in Chinese society, as the public gaze was turned toward economic development in areas that had previously been regarded as the cultural hinterland. Here MacKinnon’s argument gets a little fuzzy and it is unclear if he is referring to truly rural areas, or simply to the urban area of Wuhan in inland China. As Lee McIsaac has shown, when Shanghai urbanites got to Chongqing in late 1938, they looked down on Chongqing residents as country bumpkins, even though they lived in the cultural heartland of southwestern China (see “The City as Nation: Creating a Wartime Capital in Chongqing” in Joe Esherick’s edited volume, Remaking the Chinese City). It can be easily imagined that they saw Wuhan people in the same light, making MacKinnon’s argument that the cultural renaissance of Wuhan and the popularization of culture was achieved by the likes of authors Lao She, Wen Yiduo, and Guo Moruo, as well as other east-coast intellectuals who came in the refugee wave and stayed on, cleave a bit more than it should to the same cultural bias that Shanghailanders held against anyone who did not hail from their illustrious city. MacKinnon also argues that Wuhan enjoyed the greatest press freedom ever to be seen in any Chinese capital city before or since. For a brief period in 1938, not a single journalist or editor was assassinated. This owed largely to the disorganization of the Nationalist power structure with the hasty move, and elsewhere MacKinnon argues that by the time the GMD got to Chongqing, the secret service of Dai Li became more oppressive (“The Tragedy of Wuhan, 1938” Modern Asian Studies 30.4 (1996): 931-43). But because of the power shake-up in Wuhan, military generals from the Baoding academy were able to gain an upper hand over Chiang’s favorites from Whampoa and put a clamp on Dai Li (p. 63). Nonetheless, the Guomindang immediately maneuvered for greater censorial power, and significantly refined its propaganda work while in Wuhan (p. 70). Last but certainly not least, Wuhan’s ten-month hold-out against a concerted military assault changed Chinese, Japanese, and other foreign attitudes about the strength of the Chinese resistance. As Chinese armies fled for Wuhan, foreign reporters and observers doomed China for failure, but China’s unforeseen resilience in the battle for the central Yangzi valley changed their tune, and by the end of the siege even the fall of Wuhan could not quash the newfound optimism and an outpouring of international sympathy for China’s plight. In other words, although Japan won the military battle for Wuhan, China clearly won the spiritual and cultural battles, and the sympathetic reporting and images from Wuhan of the likes of Danish film director Joris Ivens, American journalist Agnes Smedley, and Hungarian photojournalist Robert Capa sealed international attention on China’s war. MacKinnon also argues that both the Guomindang and the Communist Party failed to organize Wuhan’s students successfully, despite the students’ ardent desire to aid in the war effort. This comes as some surprise—wouldn’t a bloody war fought on your own soil against a seemingly ruthless enemy be the perfect opportunity for the government to harness young people’s energy for state-directed projects? Yet the Nationalists battled amongst themselves for control over some 100,000 student refugees, and when the ultra-conservative Minister of Education Chen Lifu won against the more radical Peng Wenkai, Chen immediately created the Three Peoples’ Principles Youth Corps. (sanminzhuyi qingniantuan 三民主義青年團, or Sanqing for short). Chiang Kai-shek quickly motivated to turn this group into more of a motor for party revitalization (with all of its leaders well beyond their youth) than an actual youth group, and some previously independent groups joined more out of a sense of coercion than loyalty to the Generalissimo’s request that all youth groups join this new, centrally-controlled one. Hence MacKinnon’s argument that the Nationalists’ actions did not represent inherent interest in the student movement. The Communist failure was more obvious: wanting desperately to preserve the United Front, the CCP simply refused to organize any of the students on their own, satisfying themselves with a lame request that radical youth disband their more leftist organizations and join the Sanqing Youth Corps. Some youth groups that resisted were simply banned by the government. Yet despite the weakness of central Party direction, students were very much at the forefront of the refugee relief effort. They staffed refugee health clinics, organized patriotic marches, wrote and performed patriotic plays, and pasted patriotic slogans on fresh wall posters each day. I do suspect that future research on wartime Chongqing might prove some of MacKinnon’s assertions about the singularity of Wuhan to be a bit overblown. Yeh Wen-hsin of UC Berkeley is currently researching journalism in wartime Chongqing, which might show that certain pockets of journalistic freedom existed in another provisional capital. The upcoming dissertation of UC Berkeley PhD student Edna Tow, on wartime bombing in Chongqing, might show that it was not only the experience of Wuhan that impacted China’s subsequent public health infrastructure. Although I will begin my in-country research next year, my dissertation on public health in wartime Chongqing may also be able to show similar long-term effects. Nonetheless, this book is concisely written and very engaging, and MacKinnon deserves respect for going out on a limb to make forceful arguments about one of the central battles in China’s eight-year war against Japan: the ten-month siege of Wuhan. Great review. Only one very minor thing: the term "shanghailander" usually refers to British or American expatriates living in Shanghai during the early 20th century, not the Chinese. And though Shanghairen may have looked down on their "country cousins" in Wuhan, it should be remembered that during that period most of Shanghai's Chinese residents had moved to the city from other parts of China. Lynn Pan believes that the Shanghainese identity didn't really coalesce until after the Communist revolution, and I think she has a good point. But I agree with you that much more research needs to be done on other interior cities to flesh out the consequences of the wartime migration. Thanks, chinajourneys, for the clarification of the term "shanghailander" and the astute point about Shanghai identity not coalescing until some decades later. I too look forward to future scholarship on this topic.